I wasn’t born on the Outer Banks. I wasnt even born in the U.S. But I’ve grown fond of the Outer Banks and I’m proud of calling myself a local. That’s why I was shocked to learn that interest for the Outer Banks has fallen 55% since July 2004! Let me explain – while performing keyword research for an SEO client on the Outer Banks, we ran across worrisome data. I decided to dig a bit deeper, and found out that the OBX had quite the trendy status back in 2004. Beaches were more untamed back then, apparently. It was around that time the famous OBX Real Estate industry was making millionaires left and right and construction jobs were soaring, attracting not just tourists, but investors. A couple of Real Estate crisis later, along with increased gas and rental prices, we may start to understand the scenario. But one thing that macro economic signals fail to address is the competition exerted by other beach towns and their tourism boards. Specially due to the powerful tools available in Search Engine Marketing, towns were able to gain crucial exposure for vacation-related searches. The Outer Banks Visitors Bureau does a lot of things right. Their positioning for branded keywords (those that contain “Outer Banks” within the query) is extremely strong, and they maintain their site well updated. But they’re completely missing the boat on non-branded keywords, which are fundamental when trying to raise awareness. Of course, ranking for all of the keywords above is no easy feat. 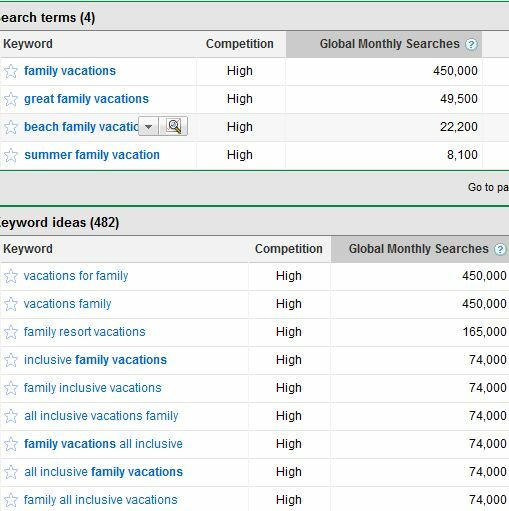 But even if we launch a Pay Per Click campaign aimed at those terms, with a 2% CTR, we’re looking at an additional 10,000 visits every month, based on the search volume for the term “family vacation” alone. I’ve recommended stronger backlinks on both SEO Blueprint for Tent Rentals and Spencer Yatchs. On this case, however, the Tourism Board needs to focus more on their anchor text. With a more diverse backlink anchor profile, focused on non-branded terms, the OBX can begin to compete for bigger keywords and more exposure. Their Google AdWords display campaign is fairly well-structured AND well-designed. 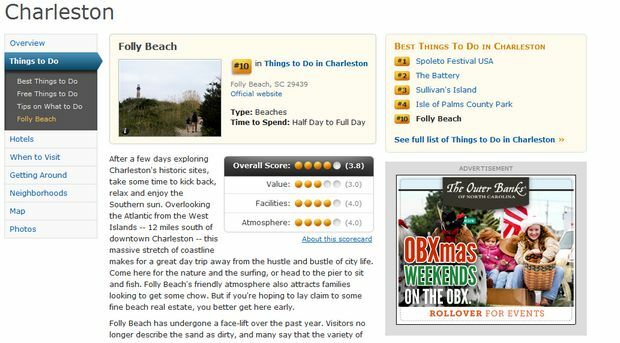 While performing research for this post, I noticed 2 fantastic OBX ads. They were clear, had a giant call to action, and very prominent on the pages. This means that whoever is running their campaign is doing a great job at retargeting and we have a great designer! But they’re missing the boat by not optimizing their search campaign (the one that shows on the search results) for the keywords I showed above. Unfortunately, I’ve only seen PPC ads on search results pages that involved branded keywords for “Outer Banks”. We’re not employed by the Tourism Board. Even though we’d love to get our hands dirty and outrank Myrtle Beach and other beaches, we have no tie whatsoever in this industry. If you’re the current SEO for the OBX Tourism Board, let us know, and we’d be happy to help. The comments are all yours! WOW, thanks Leo nice article …..wat can i do yo help?